There were dancing ‘Spaniards’ on stage long before ‘Spanish’ dances were recorded in notation. They appeared in English masques as well as in the French ballets de cour. Charles II is unlikely to have remembered the ‘grave Spanish lover’ in the second antimasque to William Davenant’s Triumphs of the Prince d’Amour, given in 1635 when he was only five years old. During his exile, Charles spent several periods in France. The last of these ran from 1651 to 1654, and the King might well have seen the Ballet des Proverbes when it was performed at the Louvre on 17 February 1654. Its final entrée of ‘Espagnols’ and ‘Espagnolles’ included the young Louis XIV and Pierre Beauchamp among the dancers (the ‘Espagnolles’ were all danced by men). It is a matter for conjecture as to how such performances might have influenced the entertainments offered by the London theatres. Charles II and his court were certainly committed patrons of the theatres, after they legally reopened with the patents granted to Davenant and Killigrew in 1660. I was interested to come across dancing Spaniards in Dryden’s The Indian Emperor, first given at the Bridges Street Theatre in 1665 and published in 1667. The dance comes in act 4 scene 3 of the play and the stage direction reads ‘two Spaniards arise and Dance a Saraband with Castanieta’s’. The dance follows a song, ‘Ah fading joy, how quickly thou art past?’ sung by ‘many Indian Women’ who are captives of the Spanish (the play deals with the Spanish conquistadors). The use of castanets suggests a dynamic dance, so perhaps it was meant to contrast with the song. It calls to mind the final entrée in the 1659 Ballet de la Raillerie in which an ‘Espagnolle’ appears ‘dansant avec Castagnettes’. However, Dryden’s inspiration was probably closer to hand. Davenant’s The Cruelty of the Spaniards in Peru, performed and published in London in 1658, also includes a ‘Saraband’ danced by two Spaniards ‘with Castanietos’. The play was revived in 1661 and Dryden must surely have known it. Was the music for the dance in The Indian Emperor Spanish or French, or did it draw on a more local tune? A country dance called The Spaniard had appeared in The English Dancing-Master when it was published in 1651 and was still included in the third edition of 1665. The music for Davenant’s The Cruelty of the Spaniards in Peru was by Matthew Locke. Undoubtedly more influential in later years, although we lack direct musical evidence, was Lully’s score for Le Bourgeois gentilhomme, which included the Ballet des Nations with its Spanish, Italian and French entrées as well as the celebrated ‘Turkish’ ceremony. The comédie-ballet was given before Louis XIV at Chambord on 14 October 1670 and repeated later the same year for the public at the theatre in the Palais Royal in central Paris. It was revived in 1689, 1691 and as late as 1716. 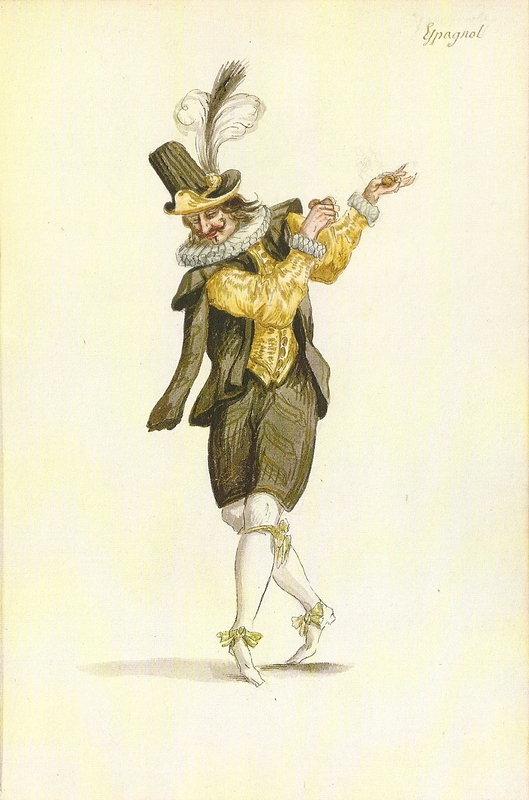 At the first court performance, the English actor Jo Haines was much applauded when he danced between the acts. Le Bourgeois gentilhomme was translated and adapted for London audiences by Edward Ravenscroft as The Citizen Turn’d Gentleman, given at the Dorset Garden Theatre in July 1672. Although it included Jo Haines as the French tutor and singing master, Ravenscroft’s version omitted the Ballet des Nations. The lasting influence of Lully’s dance music in France is clearly shown by the eight notated dances that use it. Did it also affect dancing on the London stage? Campra’s opéra-ballet L’Europe galante, first performed at the Paris Opéra on 24 October 1697, was even more influential. Its four entrées were set in France, Spain, Italy and Turkey – the same as the four nations featured in Le Bourgeois gentilhomme. L’Europe galante was revived in 1706, 1715, 1724, 1725, 1736 and 1747, providing clear evidence of its lasting popularity. There are nine notated dances to its music. The significance of L’Europe galante to French dance culture is obvious. Its importance to dancing in London is more difficult to determine, although Anthony L’Abbé later used music from the Turkish entrée for a popular stage duet. There was also a ‘Ballet des Nations’ in Europe’s Revels for the Peace, performed at the English court on 4 November 1697 to celebrate both the Peace of Ryswick which had ended the Nine Years’ War and King William III’s birthday. This work, with music by John Eccles, has dances by Spanish, Dutch, French and English men and women. The music for these dances was not included in the surviving manuscript score, but some of the tunes were published in Thomas Bray’s Country Dances in 1699. Unfortunately, the ‘Spanish’ dance was not among them. Europe’s Revels for the Peace was revived at the Queen’s theatre in 1706, so perhaps its music and dances did influence ‘national’ dances given on the London stage later in the 18th century. So, there are some clues to the nature of performances by dancing ‘Spaniards’ during the late 17th and early 18th centuries. Do the surviving dance treatises tell us anything about their dance style and technique? This entry was posted in Ballet de Cour, Dancing at Court, Stage Dancing and tagged Ballet de Cour, Baroque Dance, Saraband on January 12, 2016 by moiragoff.